Today’s message from Archangel Sandalphon reminds us to be in harmony with ourselves and our world. Can you remember that place of absolute inner harmony? Where everything felt aligned in your heart? You were in truth of yourself and with those around you…. Why do we lose this may you ask? Because for a moment, we focus on the limitations, for a moment we succumb to the chatter in the mind which reminds us how hard it is, how impossible it is. For a moment, we lose sight of our connection with God, the Universe and how important it is to align our vibration with the Highest Good. When this happens, we speak our inner mind. We speak the doubt, the struggle, perhaps our words come out wrong and is perceived by others as judgemental or offensive – yet our intention was the opposite! Archangel Sandalphon reminds us today be harmony, to ourselves (within) and to others. 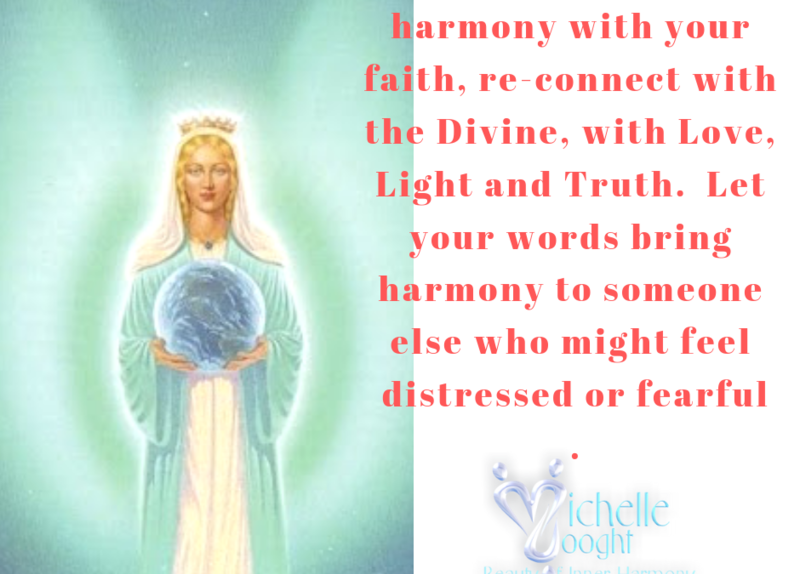 Let your thoughts be in harmony with your faith, re-connect with the Divine, with Love, Light and Truth. Make time to pray and to meditate. Let your words bring harmony to someone else who might feel distressed or fearful. Let music lift your heart and your soul and re-connect with that part of you that knows…knows that everything comes together, knows that you have the courage and the potential to step into life, knows on a deeper level that everything is as it should be. As you begin to experience inner harmony, so you can assist others to do the same. Let our words, actions, acts of kindness and yes, even our smile, bring inner harmony today.